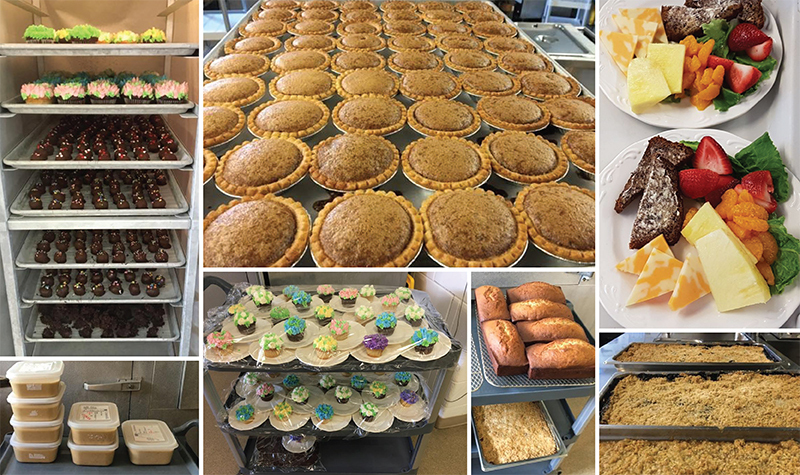 Pictured above, just a few examples of the many homemade foods prepared at Almonte Country Haven every day. If there’s one thing nutritional care manager Dave Benn takes great pride in, it’s the fact that virtually all of the baked goods he and his team serve each day at Almonte Country Haven are made from scratch. Every day the Lanark County long-term care home’s kitchen is filled with the aroma of fresh-baked cookies, muffins, breads, buns, pies and cakes. Making fresh-baked foods is a cornerstone of Almonte Country Haven’s commitment to quality, Dave says. “It’s all done in-house with no mixes,” Dave tells The OMNIway. When crème brûlée is on the menu, residents can expect the popular dessert to be freshly made. Even the traditional burnt top of the custard dessert is done by staff members using a blowtorch, Dave notes. When Almonte Country Haven hosts its monthly party to celebrate residents’ birthdays, nutritional care worker Caroleann McRae will make and decorate the cupcakes that are handed out. Asked how the kitchen team finds the time to make everything from scratch, Dave says he carefully plans the schedule to find the hours. Since he has kitchen hours for himself, he can dedicate time to making homemade baked goods as well, he adds. By making everything from scratch, Dave says Almonte Country Haven is giving residents the meals and snacks they expect. After all, homemade food is what the residents are used to enjoying. “We’re in a farming community here, and residents are used to having everything made from scratch,” Dave says. All of the cookies served from Almonte Country Haven’s snack cart are baked fresh. And there are many varieties of cookies, including chocolate chip, jam, oatmeal-raisin, shortbread, peanut butter, gingersnaps and macaroons. This keeps everyone busy, but the residents appreciate the efforts. “In fact, we probably go through about 1,500 fresh-baked cookies a week,” Dave says.